Oxygen, bronchodilators, corticosteroids, and antibiotics: which ones, and how much? More than 1.7 million patients per year present to the emergency department requiring treatment for chronic obstructive pulmonary disease (COPD), with about 20% requiring inpatient hospitalization. This costs the United States, directly and indirectly, between $35 and $50 billion each year. The GOLD guidelines, updated in 2016, contain a consensus definition for acute exacerbation of COPD, risk assessment, and evidence-based man-agement strategies. In patients with purulent sputum, a short course of antibiotics is warranted. Community-acquired pathogens include Haemophilus influenzae, Streptococcus pneumoniae, and Moraxella catarrhalis. In critically ill patients, Pseudomonas and methicillin-resistant Staphylococcus aureus (MRSA) are more common, and antibiotic regimens should be tailored to cover those pathogens as well. COPD has huge economic and human burdens in the US. In fact, in 2010, two studies estimated that COPD exacted a direct and indirect cost of somewhere between $36 and $50 billion dollars in the US. With respect to the ED – in 2011, there were more than 1.7 million ED visits for COPD-related problems, with nearly 1/5th requiring hospitalization. This episode of EB Medicine’s EMplify podcast is hosted by Jeff Nusbaum, MD, and Nachi Gupta, MD. This month’s corresponding full-length journal issue of Emergency Medicine Practice was authored by a strong team from the University of Maryland: Drs. Van Holden, Donald Slack, Michael McCurdy, and Nirav Shah. It was peer reviewed by Dr. Gabriel Wardi of the University of California San Diego and Dr. Geralda Xavier of Kings County Hospital in New York City. The mMRC Dyspnea Scale quantifies disability attributable to breathlessness, and is useful for characterizing baseline dyspnea in patients with respiratory diseases. The mMRC Dyspnea Scale describes baseline dyspnea, but does not accurately quantify response to treatment of chronic obstructive pulmonary disease (COPD). The scale does not capture patient effort, such that dyspnea from pulmonary disease (and not behavioral responses to disability) are reflected in mMRC Dyspnea Scale scores. It does not consistently correlate with spirometric measurements (eg, FEV1) for patients with respiratory disease due to COPD. It demonstrates at least moderate positive correlation with other dyspnea scores, including the baseline dyspnea index (BDI) and oxygen cost diagram (OCD) (Chhabra 2009). It is at least moderately correlated with healthcare-associated quality of life, particularly for patients with COPD (Henoch 2016). Scores are variably associated with patients’ perceptions of respiratory symptom burden or disease severity (Rennard 2002). Scores are also associated with morbidity (hospitalization and adverse cardiovascular outcomes) and, in some studies, mortality. It is used as a component of the BODE Index, which predicts adverse outcomes, including mortality and risk of hospitalization (Celli 2004). The mMRC Dyspnea Scale is easy and efficient to use. It provides a baseline assessment of functional impairment attributable to dyspnea from respiratory disease, and correlates with healthcare-associated quality of life, morbidity, and possibly mortality for patients with respiratory diseases (particularly COPD). The mMRC Dyspnea Scale has been used for almost two decades in multiple different heterogeneous patient populations. It correlates with other clinical and research dyspnea indices. Interrater reliability for the scale is very high. Use in patients with respiratory diseases like COPD, to assess degree of baseline functional disability due to dyspnea. The mMRC Dyspnea Scale is best used to establish baseline functional impairment due to dyspnea attributable to respiratory disease; tracking the mMRC over time or with therapeutic interventions is of less certain clinical utility. 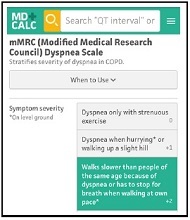 A patient’s mMRC Dyspnea Scale score, or another dyspnea measurement, such as the COPD Assessment Test (CAT), is combined with the patient’s FEV1 percent predicted and the frequency of COPD exacerbations to guide treatment interventions using the GOLD treatment guidelines (http://goldcopd.org). While the mMRC is correlated with morbidity and mortality for patients with respiratory disease, currently available data do not confirm attributable cause and effect between mMRC scores and patient-centered outcomes. Measuring mMRC Dyspnea Scale scores in patients with respiratory disease (particularly COPD) to establish baseline functional dyspnea burden is appropriate, but scores are not independently used in clinical practice to guide clinical management or therapeutic interventions. However, the Global Initiative for Obstructive Lung Disease (GOLD) treatment guidelines have, since 2011, included the mMRC as a component of a multi-faceted assessment and treatment approach to patients with COPD. The mMRC Dyspnea Scale score must be contextualized with an individual patient’s history, physical examination, and available diagnostic test results. For patients with an elevated mMRC score (eg, ≥ 2) and clinical circumstances consistent with respiratory disease, measuring spirometry (eg, FEV1 and FVC), determining the patient’s BODE and/or GOLD stage, and pursuing further targeted diagnostic and/ or therapeutic interventions are appropriate. The Medical Research Council (MRC) scale was developed in the 1950s based on questions used by healthcare providers in the Pneumoconiosis Research Unit in Cardiff, Wales, and was first referred to in a manuscript in 1952 (Fletcher 1952). The original MRC scale was developed from these clinical questions and used in numerous research studies over the past 60 years. The MRC was modified in a study in 1988, generating the modified Medical Research Council (mMRC) scale. The original study of the mMRC involved 161 patients with shortness of breath at a single medical center (Mahler 1988). Of the 161 patients, a diagnosis for their dyspnea could only be determined in 153 patients, who constituted the research cohort. Patients’ mMRC scores were compared to other dyspnea measures (BDI and OCD) and spirometric results (FEV1, FVC, and maximum inspiratory and expiratory pressures). Inter-rater reliability of the mMRC was 98% in this study, and the mMRC was moderately to strongly correlated with the OCD and BDI indices. mMRC moderately correlated with pulmonary function measurements. A subsequent validation study of 161 patients at a single outpatient clinic in Japan demonstrated factor grouping of the mMRC with other dyspnea measurements (BDI and OCD) and healthcare-related quality of life (Hajiro 1998). Furthermore, mMRC scores moderately to strongly correlated with functional assessments of patients’ cardiopulmonary fitness (including FEV1, RV/TLC, and VO2 max). Subsequent single center and small- to moderate-sized studies have consistently demonstrated moderate correlations between the mMRC and other dyspnea scores (Chhabra 2009). mMRC scores have been shown to be highly correlated with healthcare-associated quality of life, particularly for patients with COPD (Henoch 2016). However, correlations between mMRC scores and spirometric results, ABG results, or 6-minute walk distance were not noted in some studies, such that the association between mMRC results and functional metrics is uncertain (Chhabra 2009). Read more about Dr. Mahler. Mahler DA, Wells CK. Evaluation of clinical methods for rating dyspnea. Chest. 1988;93(3):580-586. Hajiro T, Nishimura K, Tsukino M, et al. Analysis of clinical methods used to evaluate dyspnea in patients with chronic obstructive pulmonary disease. Am J Respir Crit Care Med. 1998;158(4):1185-1189. Nishiyama O, Taniguchi H, Kondoh Y, et al. A simple assessment of dyspnoea as a prognostic indicator in idiopathic pulmonary fibrosis. Eur Respir J. 2010;36(5):1067-1072. Launois C, Barbe C, Bertin E, et al. The modified Medical Research Council scale for the assessment of dyspnea in daily living in obesity: a pilot study. BMC Pulm Med. 2012;12:61. Celli BR, Cote CG, Marin JM, et al. The body mass index, airflow obstruction, dyspnea, and exercise capacity index in chronic obstructive pulmonary disease. N Engl J Med. 2004;350(10):1005-1012. Chhabra SK, Gupta AK, Khuma MZ. Evaluation of three scales of dyspnea in chronic obstructive pulmonary disease. Ann Thorac Med. 2009;4(3):128-132. Global Initiative for Chronic Obstructive Lung Disease. Available at: http://www.goldcopd.com. Accessed August 2, 2017. Fletcher CM. Discussion on the diagnosis of pulmonary emphysema. Proc R Soc Med. 1952;45:576-585. Henoch I, Strang S, Löfdahl CG, et al. Health-related quality of life in a nationwide cohort of patients with COPD related to other characteristics. Eur Clin Respir J. 2016;3:31459. Rennard S, Decramer M, Calverley PM, et al. Impact of COPD in North America and Europe in 2000: subjects’ perspective of confronting COPD International Survey. Eur Respir J. 2002;20(4):799-805. Access the BODE Index for COPD Survival. The DECAF Score predicts in-hospital mortality in acute COPD exacerbation. The DECAF Score can be used in patients who have evidence of both pneumonia and COPD. Better predictor of in-hospital mortality than CURB-65 in patients who have both pneumonia and an acute exacerbation of COPD. Variables from initial labs are used to calculate the score. Requires eMRCD score, which may be difficult to obtain in patients with acute encephalopathy, dementia, or those who are intubated. In patients with SpO2 >92% without supplemental oxygen (or otherwise for whom ABG is deemed unnecessary), 0 points should be as-signed for acidemia. Validated for use at the time of admission in UK hospitals, but not yet validated in US EDs. The DECAF Score may assist clinical decision-making in terms of early discharge, escalation of care, or discussion of goals of care. Low risk (score 0-1) patients may be appropriate for early supported discharge, and high risk (score 3-6) patients may be appropriate for higher levels of care, and/or addressing goals of care. Increasing scores may correlate with longer length of stay. Do not use if patient has <12 months life expectancy or is on home oxygen. High risk DECAF Scores (3-6) are associated with both high risk of death and short time to death. Consider early escalation in care, higher level of monitoring versus palliative care for these patients. Low risk DECAF Scores (0-1) are associated with low mortality risk and these patients may be candidates for early discharge. The DECAF Score should only be used in admitted patients with a primary diagnosis of an acute COPD exacerbation, not in the outpatient setting or in patients whose COPD is stable. DECAF Scores of 5 and 6 were found to have the highest risk of death and the shortest time to death, and may warrant early evaluation for escalation of care, higher level of monitoring, or potential palliative care. The DECAF Score was derived from evaluating variables associated with in-hospital mortality from a prospective cohort of 920 patients recruited over 2 years from 2 institutions in the UK. From this cohort five independent variables with the strongest predictive ability for in-hospital mortality were selected to create the DECAF Score. Recruited patients were ≥35 years of age, had ≥10 pack-year smoking history, evidence of preadmission airflow limitation (FEV1/FVC <0.70), and were hospitalized with a primary diagnosis of acute exacerbation of COPD. Excluded patients were those with a comorbidity expected to limit survival to less than 12 months, and those on home oxygen. The DECAF Score was internally validated and performed well to predict in-hospital mortality. It was later externally validated in 2 cohorts of patients. The first cohort was made up of 880 patients from the same hospitals as the original derivation study. The second cohort included 845 patients from 4 different hospitals in the UK. In both of these validation cohorts, the DECAF Score performed well to predict in-hospital mortality and again bested other scoring systems including BAP-65, CAPS, APACHE II, and CURB-65. Read more about Dr. Steer. Steer J, Gibson J, Bourke SC. 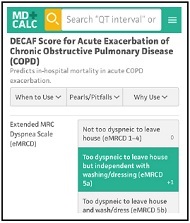 The DECAF Score: predicting hospital mortality in exacerbations of chronic obstructive pulmonary disease. Thorax. 2012;67(11):970-976. Echevarria C, Steer J, Heslop-Marshall K, et al. Validation of the DECAF Score to predict hospital mortality in acute exacerbations of COPD. Thorax. 2016;71(2):133-140. Access the Emergency Medicine Practice issue reviewing noninvasive ventilation for patients in acute respiratory distress. Access the Emergency Medicine Practice issue reviewing management of chronic obstructive pulmonary disease. Describe the differential diagnosis for patients who present with presumed acute exacerbation of COPD, considering potential comorbid or exacerbating conditions. Apply a tailored diagnostic approach based on the severity of the exacerbation. Treat COPD aggressively using an evidence-based algorithm. Determine the best disposition option for patients with acute exacerbation of COPD, based on individual risks and benefits. Date of Original Release: October 1, 2017. Date of most recent review: September 10, 2017. Termination date: October 1, 2020. Faculty Disclosure: It is the policy of EB Medicine to ensure objectivity, balance, independence, transparency, and scientific rigor in all CME-sponsored educational activities. All faculty participating in the planning or implementation of a sponsored activity are expected to disclose to the audience any relevant financial relationships and to assist in resolving any conflict of interest that may arise from the relationship. In compliance with all ACCME Essentials, Standards, and Guidelines, all faculty for this CME activity were asked to complete a full disclosure statement. The information received is as follows: Dr. Holden, Dr. Slack, Dr. McCurdy, Dr. Shah, Dr. Wardi, Dr. Xavier, Dr. Mishler, Dr. Toscano, and their related parties report no significant financial interest or other relationship with the manufacturer(s) of any commercial product(s) discussed in this educational presentation. Dr. Jagoda made the following disclosures: Consultant, Daiichi Sankyo Inc; Consultant, Pfizer Inc; Consultant, Banyan Biomarkers Inc; Consulting fees, EB Medicine.